This campsite in Chopta offers you a three days of adventure in the gorgeous Himalayan wilderness, away from the pollution and noise of your daily city life. You'll be staying in a comfortable tent and enjoying the fresh air and mountain views at Chopta which is known for its scenic beauty. You can spend the day at this campsite, go on day treks and nature walks, and enjoy a crackling bonfire at night. On your second day, you'll also be taken for a guided trek to Tungnath and Chandrashila. Chopta lies in the Kedarnath Wildlife Sanctuary in Uttarakhand, and is famous for the sprawling meadows and evergreen forests here. The campsite in Chopta is located close to the trek route leading to Tungnath, the highest Shiva temple in the world, and is also close to Chandrashila, a gorgeous emerald lake, and you'll be exploring both on your second day. From the campsite, you'll be able to see the snow-capped peaks of Nanda Devi, Trishul, and Chaukhamba. You'll sleep in luxury Swiss tents that have attached Western toilets and washrooms. You'll be served freshly cooked vegetarian meals, and can enjoy a bonfire at night. 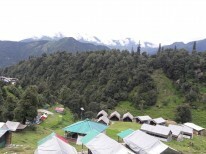 • Book a campsite in Chopta, known for its scenic landscape. • Go on a guided trek to Tungnath and Chandrashila. • Get stunning views of Himalayan giants like Nanda Devi, Trishul, and Chaukhamba peaks. • Enjoy a chilly evening around a bonfire. • Sleep in luxury Swiss tents at night. This camping trip in Chopta is a non-strenuous activity, and is suitable for anyone. However if you have a heart condition, respiratory problems like asthma, or any form of spine or knee injury, do check with your doctor before booking this Chopta camp stay. Littering is not allowing within or outside camp premises. Abusive language is not tolerated towards other campers. Please avoid loud music or any other disturbance. For cancellations made 30 days ore more before check-in to this campsite in Chopta: 90% of the trip cost will be refunded, minus any transaction charges. For cancellations made 20-30 days days before check-in to this campsite in Chopta: 75% of the trip cost will be refunded, minus any transaction charges. For cancellations made 10-20 days before check-in to this campsite in Chopta: 50% of the trip cost will be refunded, minus any transaction charges. For cancellations made 0-10 days before check-in to this campsite in Chopta: No refund. Check in time is 12:00 hrs and check out time is 10:00 hrs. For children aged between 0 to 10 year there will be no additional room charges at this campsite in Chopta. There is no pick-up for this campsite in Chopta. There is no drop-off point for this campsite in Chopta. You can check in to your campsite in Chopta by noon. You'll be greeted with a hot cup of tea, and will be ushered to your tent. You can unpack and freshen up, and then the rest of the day is yours to spend as you choose. You can go on a nature walk, or just choose a nice spot and spend it reading your favourite book. By evening, a crackling bonfire will be lit, and you can watch the sun setting over the peaks. After a hot dinner, you'll retire to your Swiss tent for the night. You'll wake up early today and will eat a hearty breakfast. After that, you'll set out with a guide to Tungnath and Chandrashila. You'll be spending the day out in the mountains, with the mountains all around. By evening, you'll return to the campsite for a bonfire and hot dinner. Wake up early to catch the early morning mist in the mountains. You can go for a run, meditate or do yoga with the mountains in front of you, or go for a walk. You'll eat a hearty breakfast, and then it's time to pack your bags. Your camping trip in Chopta ends here. Wake up in the morning to bed tea, and then head for breakfast. For breakfast you'll have many options such as parathas, bread butter with jam, omlettes, hot noodles or a traditional puri bhaji dish. When you're ready, you'll set off on a guided trek to Tungnath and Chandrashila. In the evening, you'll return to snacks and tea, and can relax around a campfire as it grows dark. Overnight in tents. Today you'll eat a hearty breakfast, and then it's time to pack up. You'll check out from the Chopta campsite after breakfast. To get to your Chopta campsite, you can take a flight to Dehradun (Jolly Grant Aiport) and take a shared cab to Chopta.